Congratulations to Pacific Northwest National Laboratory's Dr. Carolyn Pearce on her appointment as an honorary senior lecturer at the University of Manchester, School of Earth, Atmospheric & Environmental Science. The school is one of the largest atmospheric and environmental academic research centers in Britain. 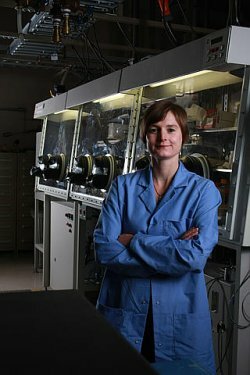 Pearce, who came to the Laboratory in 2009, is investigating how minerals and microbes affect technetium and other radionuclides in the soil at a former plutonium production site in southeastern Washington State. As a Research Councils UK academic fellow at Manchester, she investigated the microbial production of selenium-based nanomaterials linked to bioremediation strategies for selenium-contaminated soils. The appointment as senior lecturer recognizes Pearce for her outstanding value in geochemical research. The position offers her an opportunity to access resources at the University of Manchester and to continue supervision of graduate students. Pearce has authored or co-authored 29 papers in a range of disciplines including geochemistry, mineralogy, biotechnology, and nanotechnology. She is the recipient of 33 peer-reviewed synchrotron radiation beamtime allocations. Pearce also has received access awards to Department of Energy facilities such as the Molecular Foundry at Lawrence Berkeley National Laboratory. Dr. Pearce received academic development accreditation from The Higher Education Academy, UK.